The rapid adoption of mobile communication devices, and the seemingly endless functions they serve, is unprecedented. No other form of technology has grown so rapidly, or become so deeply entrenched in the everyday lives of its users. But the technology that consumers use for mobile communication and computing is only a small part of the story, because for mobile communication to be truly mobile has required the creation of a global infrastructure to provide a nearly constant and reliable wireless connection to users via a telecommunications network. Consumers marvel at the technological advances in mobile devices, but the invention, refinement, and expansion of the modern cellular network is the far greater achievement. Costing billions of dollars to create, and hundreds of millions of dollars to maintain, the modern mobile cellular network is a technological marvel. But some of the costs remain hidden. The first commercially available mobile cell phone—the Motorola DynaTAC 8000x—offered only one phone line, was capable of storing only 30 telephone numbers for rapid redial, and had an LED display capable of showing nothing more than the phone number being dialed (Wikipedia) Today’s smart phones, on the other hand, allow the user to access the World Wide Web via the Internet; watch movies and television programs made available by streaming service providers; videoconference with multiple participants; determine their precise geographic location; capture and send high resolution video and still images; and, of course, talk, text, and tweet. Moreover, today’s cellular networks connect users’ telephones, tablets, computers, and automobiles; not to mention wristwatches, fitness trackers and other “wearables”. As users of mobile communications technology have increased in number, so has network coverage. In 1985, there were 900 towers in the United States (Cell tower statistics), providing cellular telephone service to 340,213 subscribers (NationMaster). As of late 2013, there were an estimated 190,000 cellular towers in the United States (Cell tower statistics). ; and today, there are 345.2 million (mobiThinking) mobile cellular subscriptions in the United States alone. It has been reported that the number of cellular subscriptions worldwide will exceed the global population sometime this year (SiliconIndia). Of course, some of those numbers should be taken with a grain of salt. The precise number of individual cell towers and antennas is difficult to determine, since service providers are frequently tempted to inflate the number of sites in their network to appear more attractive to potential subscribers. Oftentimes publicized “towers” turned into raw land opportunities, structures that were owned by another company or towers that were in development – a discreet way of affirming it could be a year or two before they’re available, and possibly never (wirelessestimator.com). Nonetheless, the growth of network coverage is unquestionable. First only available in major metropolitan areas, cellular service is now widespread across the United States, with more cell sites added each day to meet the ever-increasing demand of the growing consumer base. Not since the construction of the transcontinental railroad system have private enterprises invested so much in the development of national infrastructure. All the more surprising, then, that the actual construction and maintenance of the towers that make up the cellular communications networks in the United States is left to a relatively small number of independent contractors; and an even smaller number of overworked and underpaid subcontracted technicians. Major cellular service providers in the U.S. typically hire management firms to oversee the construction and upkeep of their cell sites. These firms, in turn, hire tower construction companies for the on-site work. Cell carriers give several reasons for why they outsource tower work: Building and maintaining towers, though crucial to cell service, isn’t part of their core business. Contractors have greater expertise with construction. It’s more economical to hire workers where and when needed, given the up-and-down volume of work (ProPublica). But the industry practice of outsourcing tower construction and maintenance to smaller independent, and inadequately regulated private contractors also shields the major cell carriers from legal liability in the event that a tower technician suffers a workplace accident. OSHA has the authority to cite carriers if it can prove they had direct control over work or knew of safety violations. Yet, even though some carriers set prices and timetables for tower jobs – and many of their technical specifications, down to how to color code coaxial cables – their supervisors typically stay off-site and do not manage jobs directly (ProPublica). Tower climbers—or “tower dogs”, as they sometimes refer to themselves—climb cellular communications towers up to 500 feet tall—often in difficult weather conditions—building, upgrading, or conducting routine maintenance on the towers and antennas in the nation’s cellular networks. Although a few private companies offer tower climber certification courses for a fee, the job requires little formal education. Many tower climbers work on a temporary contract basis, and what little training they receive is on-the-job. Their hours are long, and their risks are high. In fact, it is precisely because of the risky nature of tower climbing that the occupation attracts a very specific personality. Combining that personality type with the high-stress demands of a rapidly growing cellular communications infrastructure was a recipe for disaster. In 2007, Apple introduced the iPhone, one of the first smartphones to be widely adopted in the United States. In a controversial decision, Apple designed the iPhone to function only on AT&T’s 2nd generation mobile cellular network. Though the move frustrated many potential buyers, it had little effect on the iPhone’s sales. Even before the day of the iPhone’s release, media outlets reported customers lining up outside Apple’s retail stores to be the first adopters of the new technology. Apple reported sales of 270,000 units in the first 30 hours of the iPhone’s release. The following year, Apple introduced the second generation iPhone 3G, and reported sales of 1 million units in the first weekend. In response to the iPhone 3G’s phenomenal commercial success—and to meet future demand—AT&T had to scramble to extend the coverage of their third generation cellular network. 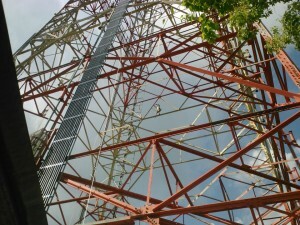 The rapid expansion of AT&T’s 3G network, however, may have directly contributed to the spike in tower climber fatalities in 2008 that led Edwin Foulke of the Occupational Safety and Health Administration to declare the occupation “the deadliest job in the United States.” (OSHA) Rushing to complete their work, with minimal oversight and inadequate fall protection, eleven tower climbers fell to their deaths while working at AT&T sites—more than the number of fatalities at all other providers’ cellular sites combined. In all, eighteen cellular tower technicians fell to their deaths in 2008; and, although that number may seem small compared to the number of fatalities in other professions (Aircraft pilots: 101 fatalities; farmers and ranchers: 291; truck drivers: 940), the number of tower climbers in the U.S. was thought to be between 8695 and 9800 at that time—a number so small that neither OSHA nor the Bureau of Labor Statistics had ever bothered to include the occupation in their annual list of most dangerous jobs. Left behind a fiancée, Bridget Pierce, and two young children, Emily, now 7, and Aidan, now 5. Under policies provided by Phoenix of Tennessee, Pierce received $200,000 in life insurance, but was denied worker’s compensation because an autopsy showed Guilford had recently smoked marijuana. Lawyers advised Pierce not to sue because of the drugs (ProPublica). Over the same period of time, AT&T’s worldwide operating revenue has grown from $62.52 billion to $127.75 billion.